Ansel Adams' Zone System - Darling or Dinosaur? I’ve written about the Zone System before, but a recent flurry of questions and requests for clarification have made me think it’s time for a refresher. 75 years ago Ansel Adams and Fred Archer were both teaching photography at what is now the Art Center School of Design in Pasadena, California. They made the announcement they had devised a simple method for analyzing the various brightness levels of a scene and using that information to anticipate and manage the way those brightness levels would be rendered in the final printing. They called it the Zone System. Their intention was not to create any sort of dogmatic methodology. It was instead to give a photographer the ability to effectively evaluate the qualities of a scene and follow through with confidence that the information necessary for the photographer’s visualization would end up on the film. Ironically, we have Ansel himself to thank for some of the confusion that surrounds the Zone System. His early writings were rife with confounding terminology and circular references. Critical information was often contained only in captions. It’s easy to believe from the above quote that you need to be a math whiz to be able to fully understand and use the Zone System. In fact, nothing could be further from the truth. You don’t need to be a math whiz and you don’t need expensive or fancy equipment. You just need a reliable spot meter, and you must understand the principles of exposure and development. The truth is, in the five+ years I worked with him in the darkroom, I never saw Ansel make a straight print. An ideal Zone System negative, if there is one, might actually look boring as a straight print. But the information is there to achieve what was visualized the moment the shutter was released. And finally, there’s the misperception of approach vs. absolute methodology. Over the years, many well-meaning, but misdirected, enthusiasts have attempted to interpret and update Ansel’s technique. Unfortunately, they missed the mark in most cases and only contributed to the myth that the Zone System is to be used exactly and to the letter. Here’s a great example of exactitude gone wrong. I had a student several years ago that had adopted a very tightly defined Zone System interpretation. He’d read it somewhere and was sure it was the last word on using the Zone System. We were up in the mountains above Santa Fe one bright afternoon and set up to photograph a stream that was in both sunlight and shade. Since I like to walk through exposure situations in tandem with a student, I asked him what his film speed was. He replied that he didn’t know yet. Hmmm. OK.
Then he took a couple of readings with his spot meter, pulled out a Palm Pilot, punched a few keys and said, “It says I can’t take the picture.” What??!!!! I had him set his meter for EI 80 for the Tmax 100 he was using, place a certain dark rock in the shade on Zone II, and then take the picture. He did. We developed it normal and it printed just fine, with just a little bit of lower-contrast burning in the high values. What’s the moral of this story? The science of this student’s approach was absolutely correct, but the approach itself was so exacting he missed the point entirely. And almost missed the opportunity to make a wonderful image. So, What Can The Zone System Do? Now let’s talk about what the Zone System can do so we can decide whether or not it has relevance today. In other words, whether it’s a darling or a dinosaur. Shadow Detail: The Zone System lets me get my film and meter in sync. I know precisely how much light it takes to get the film to start responding. I know exactly how much exposure I need in order to record an important shadow. High Values: Once I’ve determined an appropriate exposure for a shadow, I can meter a high-value and know exactly how bright it will be if I give the film “normal” development. I can then decide to increase development time if I want the area brighter or decrease the time if I want it darker. The Zone System doesn’t mandate that you adjust development to accommodate any particular value, but it gives you the choice and the knowledge to do so. Digital Application: Does the Zone System work with digital cameras? Absolutely! Digital does not easily afford the contrast control of reduced film development, but it still has a distinct range of values from black-to-burned-out. Use of the Zone System in making an exposure allows you to plan and anticipate image tonal values rather than letting the camera make the decision and winding up with an image cursed with a nasty histogram! Bottom line? Once you are used to it and have a reliable spot-meter, the Zone System allows you to achieve more accurate, consistent and planned results. And that’s regardless of your camera format or brand—and in most cases faster! I only need one reading to determine exposure, and that only takes a moment. Back to the Question: Ansel Adams’ Zone System – Darling or Dinosaur? Okay. Back to the beginning and the question of whether or not the Zone System is still relevant more than 70 years after Ansel Adams and Fred Archer first created it. Does it have a place in today’s photography? My answer is an emphatic YES! Automatic this and automatic that are all well and good, especially for the casual snapper, but keep in mind that your automated light meter can’t think. And it can’t see what you visualize for the finished image. Your light meter is just a tool. It was designed to take an average reading of light and dark in whatever subject matter it was pointed at. That means if you point it at a dark rock, it will assume that the rock is actually an equal mix of light and dark and give you an exposure to make the rock medium gray. Maybe that’s what you want. But maybe it’s not. You are the photographer and you should determine what tones are most important and how they will appear in your finished image. Instead of taking your light meter readings at face value, you have the choice to interpret what the meter is telling you and adjust your exposure calculations accordingly. Ansel Adams’ Zone System is the surest way I know of to choose what information ends up on film or pixels. It puts you in the driver’s seat of your own photography, and that’s why it still has relevance. That’s why it has a place in today’s photography. That’s why it’s a darling. I’m glad to hear someone say Ansel wasp’t easy to understand. I though I was just being dense when I first read his books ( a LONG time ago) esp. The Neg’., they were the first books I’d ever read to actually give me a headache! You are not alone! As you might guess, I adored Ansel, but for all his good intentions his technical writings were often convoluted and incomprehensible! Really enjoyed this post! I agree that the way Ansel wrote abut the ZS, was not that easy to comprehend. And, I am glad you make the point that it is still as valid today as ever. One thing I like to tell people is, even if you do not get into the technical details of using the System, it provided an eloquent language which describes the relationship between the intensity of reflected light and the tonal values in a finished print. 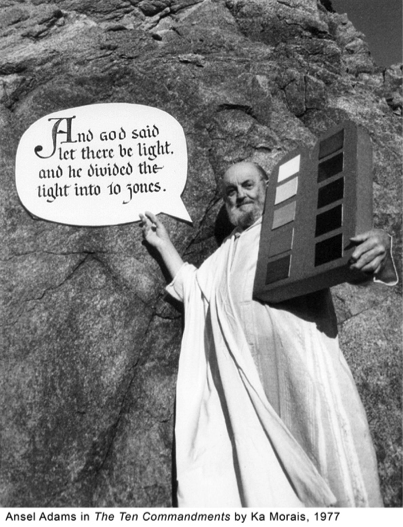 Ansel created a universal language, like music or mathematics, that describes recording light.